In the advent of the ever evolving CPU and GPU technology, it's no doubt that Virtual Reality has been the most hyped topic soon to be technology. Games & APPs applied to VR devices have already captivated gamers’ attention and everyone just can’t wait to jump into the world of games. However, it actually takes more than VR device to experience the alternative reality. HyperX, a division of Kingston Technology, the independent world leader in memory products, provides a total solution for gamers to upgrade the system and make sure it keeps up with the suggested requirements. To have nice and smooth VR gaming experience, it’s recommended to have at least 8GB modules within the system, and 16 GB if you need to work on 3D rendering or video editing. For gamers who want to upgrade the RAMs, the upcoming Predator DDR4 will end the wait. The aggressive design offers greater heat dissipation to optimize reliability while the black aluminum heat spreader and black PCB complement the look of the latest PC hardware. With fast frequencies up to 3333MHz and total capacities up to 64GB, Predator DDR4 will make sure you feel no stutter in virtual reality. HyperX Predator DDR4 DRAM delivers fast frequencies with low CL15-CL16 latencies to keep enthusiasts and gamers in the lead. HyperX Predator DDR3 DRAM is also available in speeds up to 2666MHz with low CL9-CL11 latencies for an overall faster system. Both HyperX Predator DDR4 and DDR3 is 100-percent factory tested at speed and backed by a lifetime warranty, free technical support and legendary reliability. In addition to components upgrade, the latest HyperX Cloud Revolver headset is also a perfect match for gamers looking for all around VR experience. Featureing a studio grade sound stage with 50mm directional drivers, HyperX Cloud Revolver delivers wider depth and width for improved audio precision in open environment virtual reality games, and it will match visual with perfect audio performance. To find out more HyperX VR solutions, please visit hyperxgaming.com/vr. 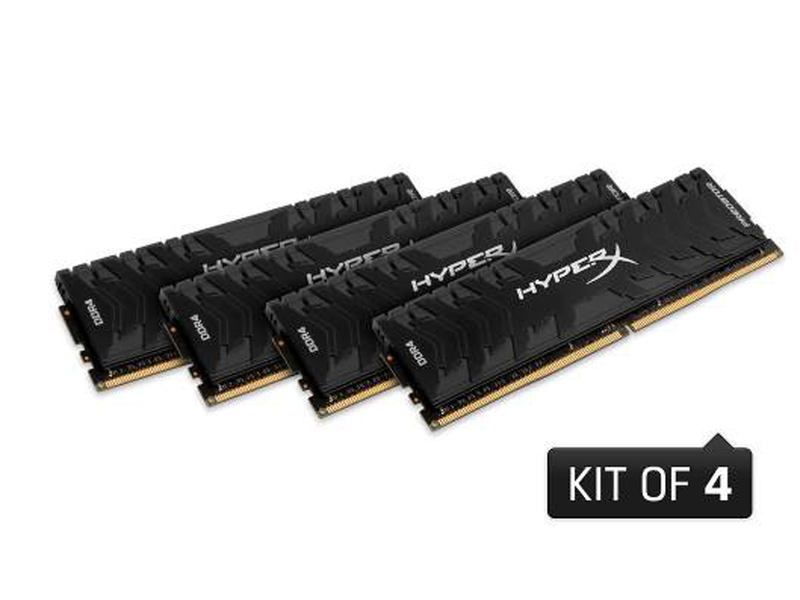 HyperX is the high-performance product division of Kingston Technology encompassing high-speed DDR4 and DDR3 memory, SSDs, USB Flash drives, and gaming accessories. Targeted at gamers, overclockers and enthusiasts, HyperX is known throughout the world for quality, performance and innovation. HyperX is committed to eSports as it sponsors over 30 teams globally and is the main sponsor of Intel Extreme Masters. HyperX can be found at many shows including China Joy, PAX, Davao Cyber Expo, and TGS & Big Fest. For more information, you can visit the HyperX home page here. • Aluminum heat spreader in fierce new look: The new dense heat spreader in black aluminum provides greater heat dissipation to optimize reliability. The heat spreader and PCB complement the look and design of the latest PC hardware, so you can dominate in HyperX style. • Extreme DDR4 performance: HyperX Predator DDR4 complements Intel’s 6 and 8 core processors for faster video editing, 3D rendering, AI processing and of course, gaming. It’s available in speeds up to 3333MHz and 4GB–16GB modules and in certified kits of 8GB–64GB rigorously tested for compatibility and performance. • Optimized for Intel 100 Series chipset and X99 motherboards: HyperX Predator DDR4 is designed for compatibility and the highest performance for Intel Core i7 HEDT processors along with the 100 Series Chipset and X99 motherboards. Hand-tuned profiles let users easily overclock and attain higher performing frequencies and lower timings. • Aluminum heat spreader in fierce new look: The new dense heat spreader in black aluminum provides greater heat dissipation to optimize reliability. The heat spreader and PCB complement the look and design of the latest PC hardware, so you can play − and win − in HyperX style. • Extreme DDR3 performance: HyperX Predator DDR3 complements Intel’s Core i5 and i7 processors for faster video editing, 3D rendering, AI processing and of course, gaming. It’s available in speeds up to 2666MHz and 4GB and 8GB modules and in certified kits of 8GB–32GB rigorously tested for compatibility and performance. • Optimized for Intel 9 Series chipset and X79 motherboards: HyperX Predator DDR3 is designed for compatibility and the highest performance for Intel Core i5, Core i7 and Core i7 HEDT processors along with 9 series Chipset and X79 motherboards. • 100-percent factory tested at speed: To keep you in the lead, HyperX Predator DDR3 is 100-percent factory tested at speed and backed by free technical support and legendary reliability.